This year, the theme for the Braid Society’s swap was “Rainbow Girl”, which I first assumed was just a fun title for a rainbow color theme. But when I finally actually read the full description, I found out that Rainbow Girl refers to a Navajo sand painting guardian figure (though swappers were given the leeway to interpret this theme in any way we wished). 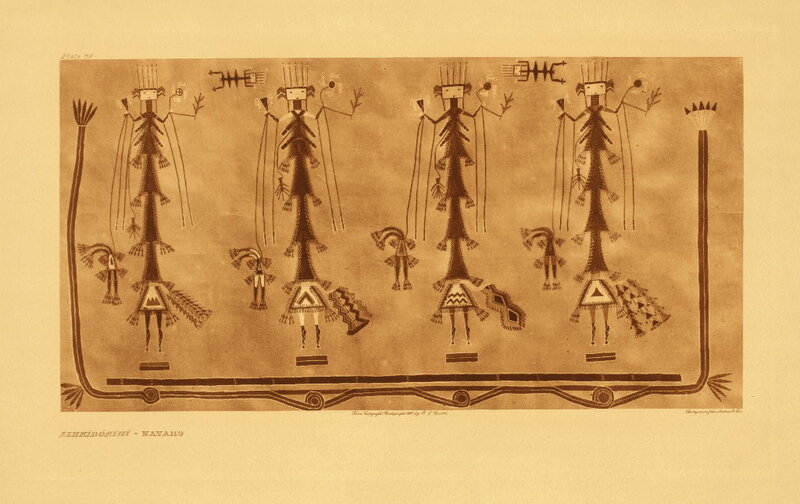 Navajo sand painting, vintage photographic print by Poley, H. S. betw. 1890 and 1908. According to the Swap organizer, Rainbow Girl is typically shown as an elongated and very abstract encircling figure, with stripes of alternating light and natural colors, a square head, a pouch, a kilt, and one or more bunches of 5 feathers. Before reading this, I had halfway decided not to participate, as summer was passing by and I had to catch up on several other projects. So I suddenly had to make 6 of these braids in a hurry to send in to the Swap—a bit of a problem, as it’s a rather slow braid to make! But I managed to get them done and sent off, if the mail goes according to schedule they should get there a few days ahead of the Swap deadline. 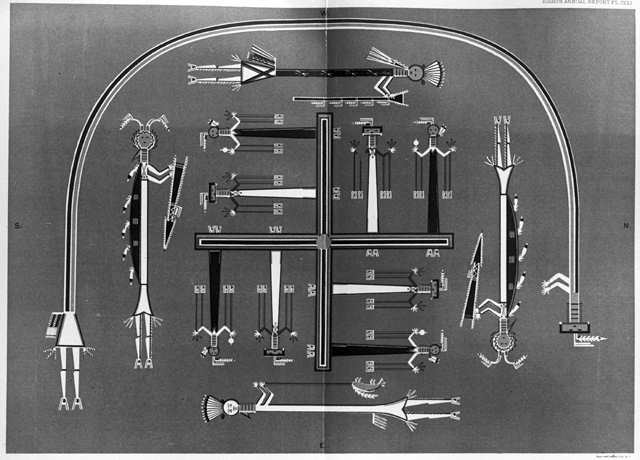 I did a little on-line research and found out that Navajo sand paintings were and are an important part of healing ceremonies, and aren’t supposed to be kept intact—they are always destroyed after the ceremony, and not allowed to be photographed. However, there are a few old photographic records from early in the previous century. 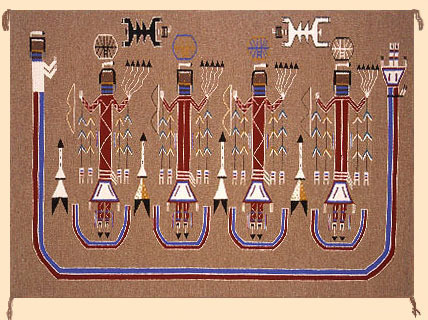 In the last generation or so, a few Navajo weavers and painters have incorporated sand painting representations into textile and painted images—often with one element omitted, to comply with the taboo against keeping a sandpainting intact. Apparently, a square-shaped head usually indicates a female Yei (a Yei or Yeii is a holy/supernatural being), and a round head a male Yei. In the images I found online, the Rainbow Guardian even looks a little bit like a braid! 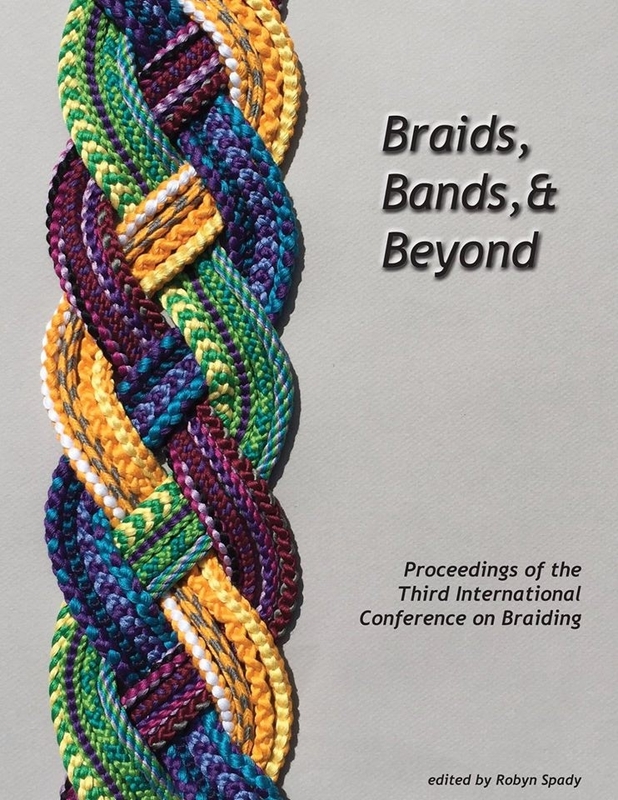 This Swap braid has a different braiding/ weave structure than the typical twill or twined loop braids in the old European loop braiding manuscripts. It’s identical to diagrams I’ve seen for a type of braided twining called plain oblique twining or POT (see an openwork example of POT here [on L-MBRIC]). Plain oblique twining is common in ply-split braiding, and according to Masako Kinoshita, it may have been done historically with loop braiding. I wonder if it’s the same thing as “warp and weft twining” which I’ve heard of as an off-loom weaving technique? It’s certainly the case that both courses or directions—like warp and weft in weaving—of the loops are twined (turned or twisted in pairs). I should crack open Noémi Speiser’s Manual of Braiding, and get hold of one of those classic references on fabric structures and figure this out! The reason this braid is slow to braid is that one loop is passed through another loop 14 times in every row (cycle) of braiding. Yet somehow the rhythm of these movements is very pleasant, and gives the illusory impression that the braid is coming along at a good clip! Which makes it fun to braid. Regular (single-course) twined braids I tend to find slightly irritating to braid—the ones where you have to turn each passive loop on each finger, before finally pulling the “traveling loop” through them all, and then start the whole thing over again. They are slow to make, and they also feel slow to make! That type of twining is called single course oblique twining, sometimes abbreviated as SCOT (especially by ply-split braiders). Many of the braids notated in the 15th C. English loop braiding manuscripts were of this type. 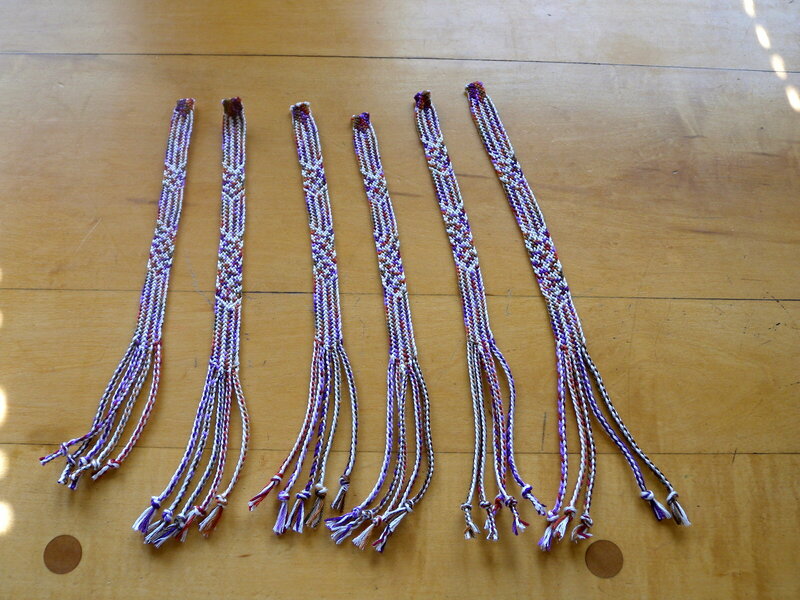 For example, laces (“lace” meant “braid” in those manuscripts) #15, 16, 24, and 25 on fingerloop.org are of this type of twining, also the 6th braid from the left in my header photo. Braids made with single course twining are beautiful, but I don’t end up making them very often. However, I’ve used the underlying Rainbow Girl braiding method for many braids—the first 4 braids on the left side of my header picture, plus the 3 widest braids (further toward the right) are all done with the same type of 1×1 braiding moves. Not all these braids are twined, though—it depends on whether you turn the loops or not while passing them through each other. If you never turn any loops, you end up with two separate layers of plain weave. I’m so impressed by your little ladies. Keep up the good work. I do love visiting your sight. I think some times I learn a little too. Hi Rosa, thanks for visiting, and the little ladies thank you for the compliment!